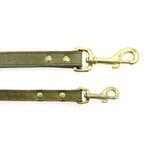 Get down right charmed with the Savannah Leather Dog Leash by Auburn Leather in Lizard Olive! 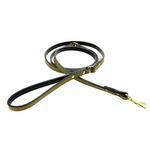 Auburn LeatherCrafters brings on a southern and stylish look with the Savannah Leather Dog Leash by Auburn Leather. Reptile print embossed leather with a stunning brass hardware adorn with a top grain leather. The natural properties of this leather produce variations on the pattern and the shading of each leash. Matching collar sold separately. Made in the USA! Family owned and operated since 1950 in New York State. Excellence is a tradition that has been passed down for generations. Handcrafted and made from the finest top grain leathers and other quality materials. **The natural properties of this leather produce variations on the pattern and the shading of each leash.